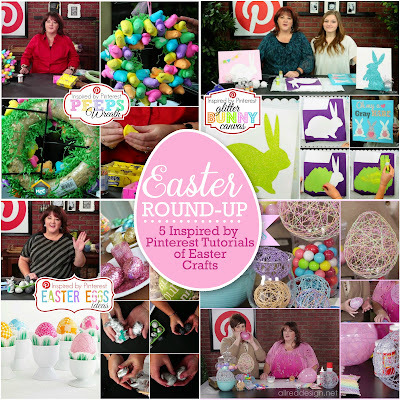 I am so excited to share some of my favorite Easter craft ideas. I've linked to the original blog post that features the video that shows you how easy and fun all of these crafts are to put together. Join me as I share how simple it can be to create your own one of a kind journals from upcycled books om today's Inspired by Pinterest Altered Journal episode. Combine your favorite children's hard bound books, some precut paper and pages of pockets is simple with the Cinch binding system from We R Memory Keepers. And be sure to check out the new We R Envelop Punch tool...it's a must have and is a simple way to create keepsake pockets for your altered journals. Join me today on the latest episode of Inspired by Pinterest as I not only show you how to repurposed your flatware and create beautiful items. But then we focus on how to do metal stamping to recreate an adorable "spooning" project. Join me today for Inspired by Pinterest as I share some fun ideas on different ways to repurpose your stash of Project Life style cards for things like banners, calendars, magnets and mini books. Don't let your collection of these fun pre-printed cards collect dust, pull them out when you need a quick project.